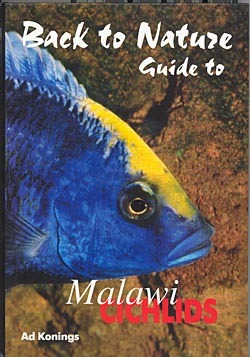 Title: Back to Nature guide to Malawi Cichlids, 1st edition. Number of color photos: app. 285. 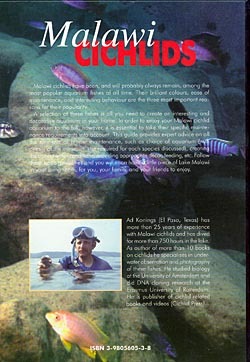 Chapters: The natural environment, The aquarium (Lighting, Decoration, Plants, The background, The water, Food), The cichlids, Index. Species descriptions: More than 210 species. Each species is described with scientific name, trade names, distribution, maximum length, habitat, food, breeding behavior, difficulty, minimum aquarium (capacity). Comments: This book is no longer available.